This op-ed originally appeared in the April 28, 2016 edition of the Los Angeles Daily Journal. What would Justice Merrick Garland mean for the U.S. Supreme Court? Despite signals that recalcitrant Republicans want to avoid this discussion, I hope lots of different groups begin to have a public dialogue about this important question. I teach, research and write in the area of disability law, a subset of civil rights law. Laws like the Americans with Disabilities Act have helped people with disabilities attain full citizenship in our country, yet there is still a long way to go. Cases involving the civil rights claims about people with disabilities raise important questions involving individual rights, business' ability to comply with regulations in a cost-effective manner and state power. There are no easy answers. Yet one important thing about disability law is that it has tended to transcend typical left-right and Democrat-Republican divisions. Even in an era of extreme polarization, laws protecting the civil rights of people with disabilities have still been passed. There are lots of open legal questions within disability law, but ones on which there are potential political and judicial consensus. This makes the choice of the next Supreme Court justice an important one, and one about which lots of people should care. Disability is a growing category - it is the one minority group we could all join at any time. Judge Garland does not himself have an obvious disability or life experience with disability that is yet part of the public record. So the cases he has decided offer the best road map for what his decision-making in this area might look like. Garland has written hundreds of opinions and participated in thousands of cases - here, I only have space to talk about a few, focusing on opinions or dissents Garland wrote himself. The Federal Communications Commission has recommended approval of Charter Communications’ merger with Time Warner Cable, making the combined company the nation’s second largest broadband provider. As a condition for FCC approval, Charter/TWC will not be able to impose usage-based charges or data caps on its broadband subscribers for seven years. Can the FCC impose such a condition? Maybe, but ultimately it may not matter. In 2002, under a Republican administration, the FCC ruled that cable broadband was an “information service,” and thus mostly unregulated under the Federal Communications Act of 1934 and the Telecommunications Act of 1996. The Supreme Courtt upheld that determination in NCTA v. Brand X (2005). In 2010, the FCC began regulating cable broadband to achieve Net Neutrality, but in Verizon v. FCC (2014) the Court of Appeals for the DC Circuit invalidated the FCC order because the agency had earlier deemed cable broadband to be an information service, hence not subject to FCC regulatory jurisdiction. Last year, under a Democratic administration the FCC reversed its 2002 Order and ruled that cable broadband was a “telecommunications service,” and thus within the agency’s Title II jurisdiction (as a public utility). 2015 Report and Order on the Open Internet aka "net neutrality"). It is this ruling that allows the FCC to impose a no-cap policy (as a condition for merger). Verizon has once again appealed the FCC Order; that case is pending. If the DC Circuit upholds the 2015 Order, then the no-cap condition will stand. If it invalidates the Order, then cable companies may have wide berth to do as they wish. Keep in mind that the FCC is only 1 of 3 federal agencies who have to pass on the competitive effects of telecom mergers; the other 2 being the FTC and the DoJ. In the case of cable companies, state regulators may have to approve as well. Also keep in mind that cable companies will increasingly rely on broadband revenue as more customers cut the cord on cable video service. That’s why it is so expensive (roughly $50/mo for a service that costs the company far less than that). But even though cable companies have a license to print money, I still wouldn’t put my marbles there. That’s because customers will soon be able to cut the cable broadband cord too. We are in the middle of an FCC auction that will repurpose TV frequencies (channels 46-51) from broadcast TV to mobile Internet (ch. 52-69 have already been reclaimed). Once that happens, the speed of your Internet connection on your cell phone will rival that on cable (or DSL). Then we can kiss the cable companies and their monopoly prices goodbye. 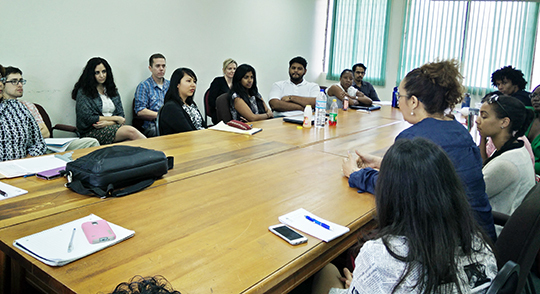 This spring break, the students of the International Human Rights Clinic, supervised by myself and Professor Veronica Aragon, carried out human rights fact-finding in Trinidad and Tobago. Our students honed their attorney skill sets by preparing for and conducting in-depth interviews regarding the country’s treatment of irregular migrants. Interviewees included government officials, a representative of the United Nations High Commissioner for Refugees, case advocates from local migrants’ rights organizations and an attorney with the Nigerian consulate, as well as several migrants with an array of demographic backgrounds. We will use the information gathered from these interviews to draft a report analyzing the country’s development and implementation of alternatives to detention (ATDs) for migrants. Currently, many migrants arriving in Trinidad and Tobago are held in a highly controversial detention center. Refugees and asylum-seekers, however, are generally allowed to live in the community, albeit subject to orders of governmental supervision and without work permits. Our report will evaluate this ATD scheme under applicable international human rights standards and set forth recommendations for modification and possible expansion. The hope is that Trinidad and Tobago may eventually serve as a model for the Caribbean region with respect to its migration policies and practices. The report will be co-authored by law students from the University of the West Indies (UWI), alongside whom the Clinic students conceptualized this project and conducted their interviews. Indeed, the Clinic’s collaboration with UWI has been one of the most rewarding aspects of this project, fostering cross-cultural exchange and new friendships that promise to endure well past the end of the semester. Loyola Law School, Los Angeles Associate Dean Alexandra Natapoff has been named as the recipient of a 2016 Guggenheim Fellowship for her scholarly work on misdemeanors and the American criminal justice system. The highly prestigious award is bestowed annually on a short list of scholars and artists from among 3,000-4,000 applicants, and less than 1 percent of recipients since 2000 have been in the legal field. Natapoff is an award-winning legal scholar and criminal justice expert at Loyola Law School, Los Angeles. She has been writing about misdemeanors for the past several years and is a leading expert in the field. She has published in-depth articles on urban misdemeanor policing and race, the prevalence of wrongful misdemeanor convictions, the challenges of misdemeanor decriminalization, the enormous hurdles facing misdemeanor public defenders, and the close linkages between the petty offense process and the welfare state. The Guggenheim Fellowship will support her current book project, which explores the profound significance of misdemeanors for the entire U.S. criminal system. Natapoff, a former federal public defender, also is a national expert on the use of criminal informants. Her previous book, Snitching, won the 2010 ABA Silver Gavel Award Honorable Mention for Books and was a 2010 Barnes & Noble Best Pick. She is a graduate of Yale and Stanford, and an elected member of the influential American Law Institute. She has testified before Congress and is frequently quoted by major media outlets. Since 1925 Guggenheim Fellowships have been awarded annually to an elite group who demonstrate impressive past achievement and future promise in their fields. Finalists undergo rigorous critical review by the John Simon Guggenheim Memorial Foundation, peer experts and past recipients. Only about 5 percent of applicants are selected for the honor. The field of law is particularly selective, with just two honorees in 2016. The fellowship includes a grant to support the recipient’s work.